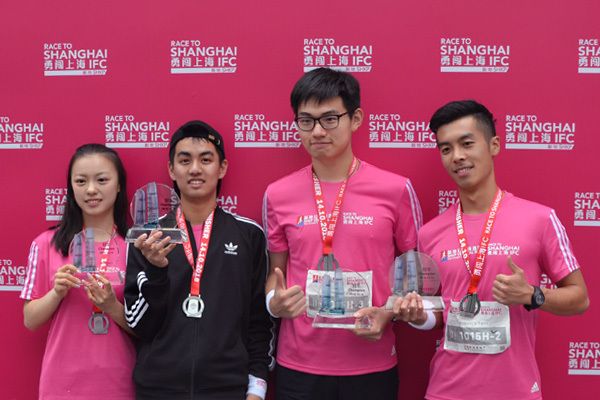 A contingent of 22 NYU Shanghai students swirled up 1,460 stairs and 57 floors to top of the Shanghai International Financial Center in Lujiazui on October 14, sweeping three “gold medals” at the sixth SHKP Vertical Run for Charity. Sophomores Ma Jiaji ‘21 and Ye Siming ‘21 took first place in the men’s and women’s races, respectively. While an all-freshman team consisting of He Yancheng ‘22, Zhang Yuechuan ‘22, Gu Suqing ‘22 and Ding Yuanchao ‘22 took first place in the team relay. It was the third year that NYU Shanghai community members had competed in the charity event, organized by Sun Hung Kai Properties Limited (SHKP) to support the Shanghai Children's Health Foundation and its efforts to improve medical treatment for children from impoverished families. 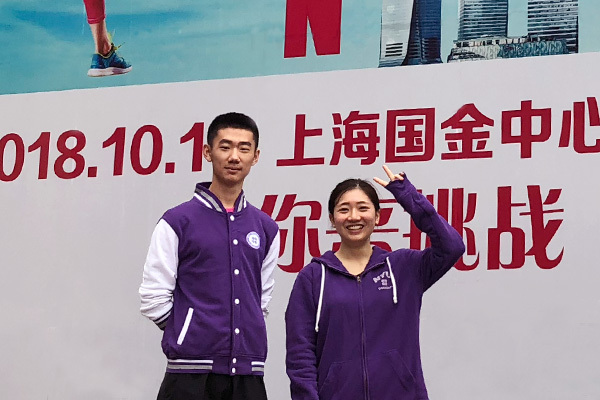 The NYU Shanghai runners, sponsored by Dean’s Service Corps (DSC), competed in the 16-19 and 20-29 age groups against peers from local high schools and colleges. Another 25 students volunteered at water stations and the information desk. Ma Jiaji '21 was the first racer to hit the finish line in his age group, posting a record time of 11 minutes and 1 second. He admitted the race was not easy, as it required excellent stamina and muscular strength to fight gravity while ascending stairs. Another sophomore, Christian Stalker ‘21, took third place, making it to the top of the tower in 13 minutes and 38 seconds. “I trained myself through aerobic exercise and deep squats, knowing that climbing over 1,000 stairs would pose enormous pressure on our knees,” Ma said. The 19-year-old boy also took advantage of the stairs of the Academic Building as his training ground. In contrast, Ye Siming ‘21, who took first in the women’s division, was quite breezy about the competition. She said she considered the event as more of an alternative fitness option to complement her three-times a week 7-8 km outdoor runs. In winning the women’s division with a time of 13 minutes and 33 seconds, Ye passed even some contestants in the previous group who had started 10 minutes before. “My energy bottlenecked when I reached somewhere around the 30th floor. Luckily, I was able to take a breath to recharge myself at the nearest water station. Also, I was especially motivated when I surpassed many male contestants in the previous group, who thumbed at my speed,” the Zhejiang native said. Sydney Fontalvo ‘22 followed two minutes later, winning third place in her first attempt at the vertical run. NYU Shanghai saw success in the relay division as well, when the freshman team of He, Zhang, Gu, and Ding crossed the finish line in 10 minutes and 10 seconds. 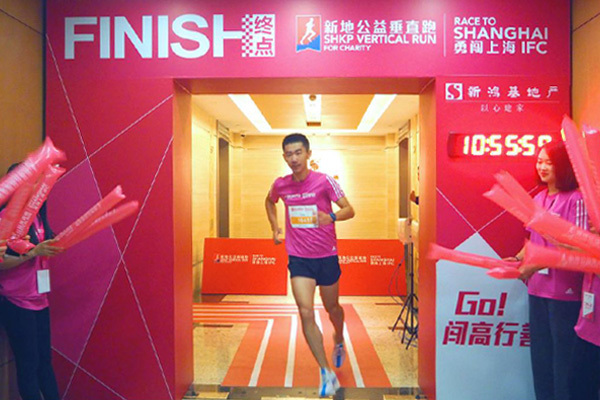 They were one of three teams of NYU Shanghai to participate in this year’s Vertical Run. “Different from individual races where runners can adjust their pace at different stages, relays require team members to gear up from the ground floor in the first second,” said He, who admittedly almost collapsed due to dizziness and exhaustion after sprinting the first 19 spiraling stories for his team. “It was a wonderful experience and allowed the four of us to bond deeper over sports.Thanks to our flawless teamwork, we managed to maintain the lead until the very end,” he added.